It is my sad responsibility to tell you that I just heard from Abby Root, Nile's wife. He died peacefully at home this Friday after a long fight with cancer. Nile was in home hospice and Abby and son Jim were at his side. Nile Root, Professor Emeritus, College of Imaging Arts and Sciences, School of Photographic Arts and Sciences, Rochester Institute of Technology, has been active in the field of biocommunications for over 45 years. 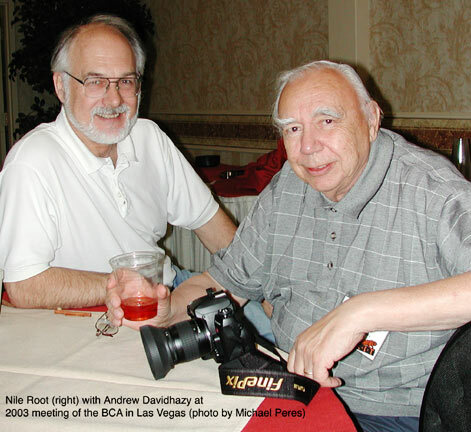 He is a Registered Biological Photographer (RBP), a Fellow of the Biological Photographic Association (FBPA) and a Schmidt Laureate, the highest honor awarded by the BPA - now renamed the BioCommunications Association, (BCA). He directed the RIT program in Biocommunications for over 12 years. He retired in 1986. While at RIT he was also the director of a government grant (1973-77) for development of a baccalaureate degree in the field of biocommunications. In 1986 Nile received the Award for Outstanding Teaching at the Rochester Institute of Technology. Nile served as a Photographer's Mate in the U. S. Navy in World War ll. After his discharge, in 1946, he was employed by the U.S. Field Information Agency, Technical (FIAT), in occupied West Germany as a microphotographer. He traveled throughout West Germany microfilming captured documents. Since 1965 Nile has participated in nearly every exhibit of biological photography sponsored yearly by the BPA. He has received over 50 awards including 16 First Awards for his photographs. He has had several hundred biological photographs published in books, professional journals and magazines. After his retirement in 1986, he and his wife, Abby, lived in Japan for two years where Abby taught English in a Nagasaki college and Nile photographed. He also conducted seminars for a group of doctors who wanted to increase their fluency in English as it related to medicine. Nile and Abby traveled throughout Southeast Asia. Nile photographed the total solar eclipse of 1988 from aboard a cruise ship in the Celebes Sea, near Borneo. They spent two weeks in China visiting major cities from Beijing, to Xian, to Singapore, days before the Tiananmen Square uprising. When Nile and Abby returned to the U.S. they settled in Tucson, Arizona, partly so that Nile could continue with his interest in astronomy and in archaeoastronomy. In March, 1994, he published an illustrated paper in Sky and Telescope magazine on an ancient sun-watching station near Tucson. His research on this site has continued to the present. 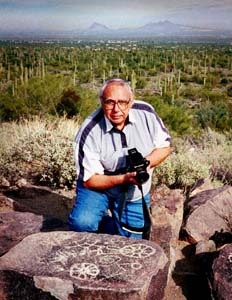 He has many images of distinctive shadow patterns on prehistoric Native American petroglyph celestial symbols: patterns made during the solstices and the equinoxes, usually at sunrise. His interest in petroglyphs, pictographs, and prehistoric ruins has led him and Abby to travel throughout the Southwest in recent years. Two of their favorite sites are Chaco Canyon, in New Mexico, and Canyon de Chelly, in Arizona. Nile has made hundreds of photographs of petroglyphs at Three Rivers, and Boca Negra Canyon in New Mexico, and at Painted Rocks and Signal Hill in Arizona. He has interesting photos of pictographs that are about a thousand years old from Chaco Canyon, and from Hueco Tanks, in Texas. During his years in photography he has had 26 one-person exhibits of personal creative images in U. S museums, galleries, and universities, as well as in two galleries outside the U.S. He has also been in over 40 group shows. He recently completed a one-person fine art exhibit of computer enhanced images, CHINA. The exhibit opened in February, 1999, in Tucson. A subsequent one-person exhibit cyberZENopened in February, 2000, in Tucson. Nile's web site was initially created with the expert advice and help of his son, James, a web and computer consultant living in Los Angeles. The site received the First Award in 1999, from the Arizona Daily Star newspaper in a competion of local non-commercial sites. Nile's home and office are at 7812 East Elida St., Tucson, AZ 85715-5009. His biography is included in Who's Who in America. Note: A fund for a purchase prize of a print from the annual School of Photographic Arts and Sciences HONOR'S SHOW has been established in the Biomedical Photographic Communications department to honor Nile and his contributions to the school. Contact Prof. Michael Peres at mrppph@rit.edu if you would like to add to this fund. June, 3, 1999, I added SIGNAL HILL, ARIZONA--- an ancient observatory which shares its secrets through my photographs made over an eight year period. REVISED JANUARY 16, 2000. Also see my presentation on the GILA CLIFF DWELLINGS in N.M. --- (another ancient observatory?). July 8, 1999, --- I added my photo essay on CHACO CANYON, N.M., and its astronomical connections. I hope that you will explore these three subjects, all found through the next page in the CONTENTS. September, 5, 1999, --- a major section, The THREE RIVERS PETROGLYPH SITE. See and read about some of the mysterious and intriguing ancient images from this area in south-central N.M.
September 11, 1999, --- petroglyph images from 12 different sites -- see PREHISTORIC ROCK ART in the SOUTHWEST. October 2, 1999, ------ cyberZEN, an exploration of form and color in nature. November 1, 1999, --- JAPANESE PATTERNS, photographs made over a two year period. November 6, 1999, --- ASIAN JOURNEY, selections from one-person exhibit. December 26, 1999, --- EL MORRO, where prehistoric and historic inscriptions meet. January 24, 2000, --- CELESTIAL EVENTS, revised to include lunar eclipse of 1/20/00. April 2, 2000, --- ARIZONA-SONORA DESERT MUSEUM, a world-renowned site. May 27, 2000, --- ANTELOPE CANYON, A beautiful slot canyon. July 8, 2000, --- MONUMENT VALLEY, Magnificent land of the Navajo. December 17, 2001, --- EASTER ISLAND, Mysterious remote island in the South Pacific Ocean. January 7, 2002, --- MIND POWER or HOAX? Thoughtography, An examination of the claim that thoughts can be recorded with a camera. January 30, 2002, --- PATAGONIA, CHILE The rugged snow-covered peaks of the Andes. August 6, 2002, --- MACHU PICCHU, PERU The Lost City of the Inca. April 7, 2003, --- COPPER CANYON, MEXICO A Geological marvel. November 13, 2003, --- KARTCHNER CAVERNS, ARIZONA, A special tour where photographs were permitted. January 23, 2004, --- JOSHUA TREE NATIONAL PARK, CALIFORNIA, Explore an alien landscape. Nile, thanks for all the good times. We'll miss you.